Oilman T. Boone Pickens made a statement on MSNBC's Morning Joe Wednesday that should make every green jobs advocate including Barack Obama, Al Gore, and Van Jones sit up and take notice. MSNBC on Wednesday suspended host Donny Deutsch in the wake of a segment on Tuesday about what role hosts such as Keith Olbermann and Ed Schultz play in making this country "America the angry." During the piece, Deutsch played a clip of an Olbermann rant and didn't defend Schultz when conservative radio host Hugh Hewitt attacked the "the biggest hate mongers in television." However, in February, when Deutsch dismissed Hispanic senatorial hopeful Marco Rubio as a "coconut," a term that the New York Times described as meaning "brown on the outside and white on the inside," MSNBC took no action. You almost need a flak jacket to go on an MSNBC show these days - at least judging by the rapid fire attacks displayed on the March 2 "The Dylan Ratigan Show." 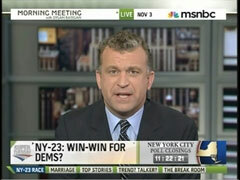 Either host Dylan Ratigan was trying to play to MSNBC's rabid liberal audience or he really has it in for the Tea Party movement based on some exaggerated notion it is nothing but hate and fear mongers. In an interview with Mark Williams, a conservative talk radio host and sometimes spokesman for the Tea Party Express, Ratigan asked Williams what he was doing to separate his legitimate effort from radical fringe elements in American political culture. "Mark, how do you draw the bright line between the very admirable and understandable principles that are advocated by so many in the Tea Party as it pertains to a Constitutional definition of a democracy, separation of things like banking and investing, church and - I mean, you go to all these things, and those who would choose a more radicalized view or racist view and hide, if you will, inside of the Tea Party umbrella?" Ratigan said. 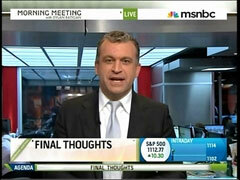 After taking time out of his last few broadcasts to try to clarify his Feb. 8 remarks that the "snowpocalypse" was because of global warming, one would hope MSNBC's Dylan Ratigan would have learned his lesson. Ratigan spent a portion of his Feb. 10 and now a portion of his Feb. 11 shows trying to clarify his statement - that "these ‘snowpocalypses' that have been going through D.C. and other extreme weather events are precisely what climate scientists have been predicting, fearing and anticipating because of global warming," as he said - but that he didn't necessarily believe that premise. "Now, in addition to that being completely wrong on so many levels, it's also a total misrepresentation over the climate change theory that I was attempting to explain," Ratigan said. "Let me be very clear - I do not believe that this storm is proof of climate change. And I do not believe that this storm is not proof of climate change. But I do believe that you, Mr. Beck, did a tremendous disservice to your viewers by bastardizing the most basic science behind the theory, period. That's not very good." Immediately after taking shots from some conservative voices for his Feb. 8 remarks that heavy snowfall in the Mid-Atlantic is "reportedly" a result of global warming, MSNBC host Dylan Ratigan fired back at his detractors on his Feb. 10 program. The once seemingly rational host of CNBC's "Fast Money" voiced his frustration with the entire global warming debate as it stood in the wake of this record-setting winter weather event. Ratigan suggested neither side should use the crippling snowfall as evidence to further their respective arguments. However he did direct the lion's share of his criticism at conservatives. "The weather we know is frightful, but my goodness me, so is the political back-and-forth over climate change in the context of these storms that are hitting D.C. especially," Ratigan said. "Both sides trying to use hometown ‘snowpocalypse' as free advertising for their chosen position on climate change, baby. Conservatives today, using the blizzard to pull a snow job on Al Gore and his liberal brethren. From South Carolina, Sen. Jim DeMint says quote, ‘It's going to keep snowing in D.C. until Al Gore cries uncle.' That was a good one. Meanwhile, Minority Leader Mitch McConnell asks ‘Where is Al Gore now?'" With Washington, D.C. buried beneath at least 20 inches of snow, and with more in the forecast, common sense would suggest global warming alarmists look elsewhere to make the argument to raise awareness for their concerns. But no, Dylan Ratigan thinks it's ridiculous to suggest all the snowfall totals could cast doubt on the theory of anthropogenic global warming. On MSNBC's Feb. 8 "The Dylan Ratigan Show," Ratigan criticized those who would dare express misgivings about climate change based on the so-called "snowpocalypse." "Here's the problem - these ‘snowpocalypses' that have been going through D.C. and other extreme weather events are precisely what climate scientists have been predicting, fearing and anticipating because of global warming," Ratigan said. MSNBC's Dylan Ratigan on Friday got into a very heated discussion about healthcare reform with Debbie Wasserman Schultz (D-Fla.) that resulted in the "Morning Meeting" host abruptly ending his interview with her and moving on to another guest. It basically allows the taxpayer to take the hit to pay for the uninsured, but it does not deal with the underlying symptom as to why there are so many uninsured...[P]art of the problem in this country is that our politicians do not understand that they make laws that create total imbalances. Some of the clearest examples of MSNBC’s liberal bias can be found in the onscreen graphics selected for the network’s programming. In the span of 20 minutes on Tuesday, three such Morning Meeting images stated a pretty clear opinion about Joe Lieberman’s opposition to parts of the health care bill. At 9:20am, one whined, "Joe Blowing Health Reform?" At 9:01, another graphic actually used an exclamation point, not often seen in supposedly objective reporting: "Say It Ain’t So, Joe! Lieberman: No on Buy-In." 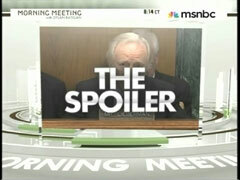 At 9:14, a picture of the senator appeared onscreen with the words "THE SPOILER." MSNBC's "Morning Meeting" is about to get an afternoon edition. TVNewser has learned that starting Monday, host Dylan Ratigan will be on for one hour, 9am ET only, so he and the team can prepare for a move to the afternoon after the first of the year. Every once in a while, a liberal cuts right through the hemming and hawing and verbalizes his true world view. Like Hollywood producer Gavin Polone commenting on the Tiger Woods episode: If you can't live up to the terms and responsibilities of an institution, the institution must change. That's essentially the lesson Polone believes Tiger should draw from his adultery disgrace. Marriage, you see, is an anachronism that doesn't fit with how we moderns live our lives - or at least, how the important people in Hollywood live theirs. "I know a lot of famous people," Polone said on Dec. 3 during an interview on MSNBC's "Morning Meeting." "And actually the norm is that they cheat." Polone, who produced the 2009 movie "Zombieland," argued that it isn't fair for stars like Tiger Woods who are "in the public eye" to be "called to task for their behavior" - behavior that Polone said is "probably pretty natural behavior given what they're going through." The real problem lies with society's idea of marriage. As a people, he said, we need to "rethink the idea of locking into someone for what one would call a lifetime marriage."